Hello, I've been keeping busy this week, stockpiling baked donuts and salted choc chip cookies ahead of a friend's housewarming this weekend. It's definitely helped me stay warm, especially as the temperature has already dipped below zero! 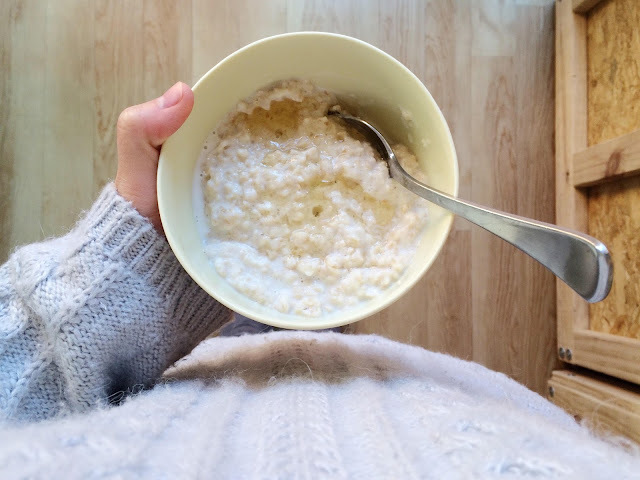 How to make perfect creamy porridge and spiced porridge. A beautiful podcast featuring the work of Lachlan Brown, a poet who is now based in Wagga. A merino jumper I'd love for the coming months. Two great videos from The Design Files - a Melbourne morning with Raph Rashid of All Day Donuts, Beat Box Kitchen and Taco Truck and this film about a modest home in country Victoria. I signed up to Medium and am curious to explore their offerings after reading this article. And a homely looking hotel.